I'm going to take a tangent here for a minute before I get to your freebies. I hope ya'll don't mind. ;) Building a house is really stressful. People warned me, "Building a house is one of the most stressful things you'll ever do." The whole process of picking the fixtures, the financial paperwork, and drafting of the contract was pretty painless. The actual construction, tests my patience every day. I'll drive by and see crews working on every house on our street but ours, or multiple contractors working on other houses, while only one contractor works on ours. Then you see houses that started after you get ahead, and well you feel frustrated. It's hands down the most stressful thing I've done other than job searching for my first teaching job six years ago, and I'm more than ready for it to be over. Originally, we were given a projected closing date that was before my school year started. Now, we are looking at closing after school starts. :( Taking time off, for closing and a final walk through, is just not something I'm really looking forward to right now, even if that does mean I get the keys to my very own house at the end. Okay, rant over, I just had to vent for a second to people other than my husband... :) You want to know another thing that stresses me out? Parent communication. I'm talking about the parent communication outside of newsletters and conferences, you know the difficult phone calls, the small talk while they volunteer, classroom parties, etc... Maybe it's because I'm not a parent and I can't connect with them on the parenting level, or maybe it's just my personality, I'm very much an introvert. Parent communication got easier as time went by at my old school, because I had a rapport with many of my parents from either having one of their other children previously and because I had been in the building for a while. Even though now and again I had to make some really difficult phone calls and deal with some uncomfortable situations, most of the parents I dealt with were very kind and respectful, and I felt overall I had a really good relationship with the parents of the kiddos in my class. Moving to a new school this past year was hard, because I didn't have that rapport. Many parents thought it was my first year of teaching ever, even though it obviously wasn't. I even had one parent this year pretty much bully me with very mean notes almost daily. Thankfully, I have a great principal who is very supportive of his teachers and who basically told her "if you don't have anything nice to say, don't say it all." Since parent communication can be a source of stress for me, I try to keep it as organized as possible. I have a binder with tabs for all my students, numbered so I don't have to change them each year, with the forms pictured below for each of my kiddos. I run these two forms 1-2 sided on the copier and have them on my students desk at Meet the Teacher Night. 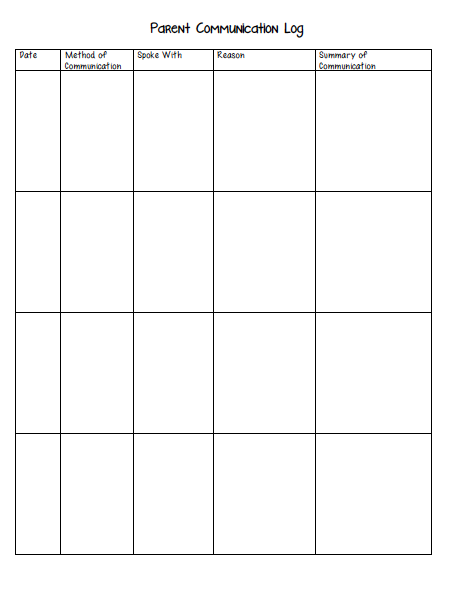 These forms are super helpful, because I know exactly how the parents want to be contacted when I need to communicate with them and I have a place to record notes of our communication, this is especially helpful for phone calls and little school chats about various issues. If a parent sends in a note/email, I place a copy of the note/email, as well as my response, in their child's spot in my binder as well. 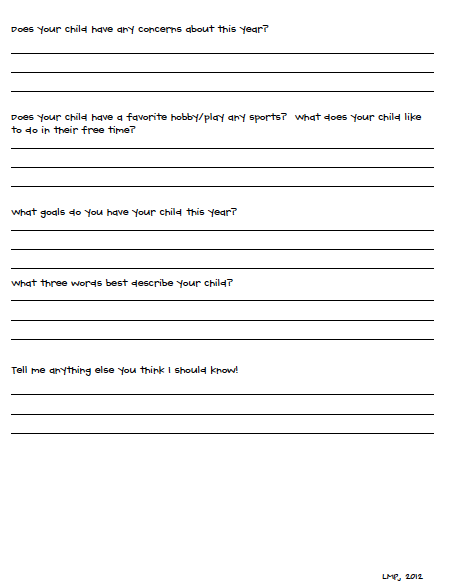 I give my parents this form at Meet the Teacher, but encourage them to take it home, and really think about their answers. I tell them to write as little, or as much as they would like, but this form really does help me get to know my students so well from the people that love them the most, their families. I also refer to the goals they have for their child/any concerns they have for the school year during our first conference as well. I have upload these forms to Google Drive for you, so strange to not say Google Docs. Just click on the pictures to download. The parent contact information sheet and the parent survey are in one PDF, and the log is a separate PDF file. 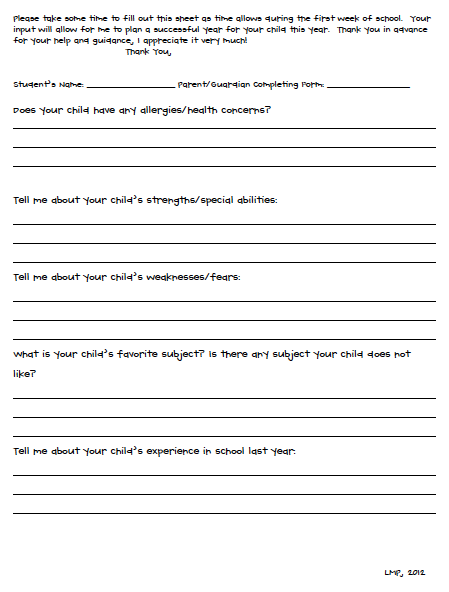 I also give parents some paperwork on Open House to take home and fill out, very similar to yours. 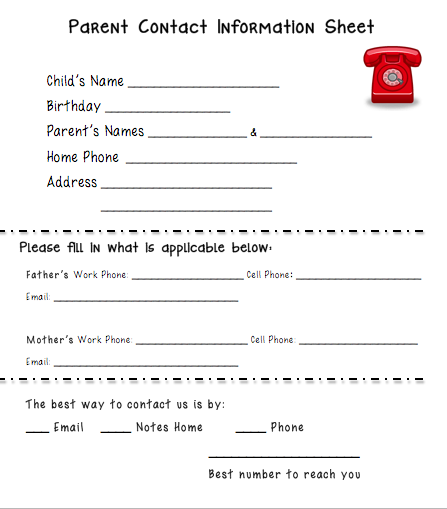 Our school has gold forms which parents fill out the top part with address, phone #, etc. Then, at the bottom is where we write down every bit of communication from the date, time, type of communication, reason, and outcome. I have found it to be very helpful in keeping parent communication organized. I laughed when I read that you don't enjoy small talking with parents! I think I do an okay job of communicating with parents, keeping them in the know, and whatever, but I am TERRIBLE at small talk! It's always so awkward!! Thank you, Lisa. I agree, parent communication can be tough sometimes. What helps me is to not dwell on it too much and just make that phone call. The more I think of it, the harder it gets to pick up the phone. These forms are great! I have a survey similar to yours and it is very helpful. Thank you for sharing! thanks for these amazing posts. love your blog. Finding the best Babymeng classes for your needs can be overwhelming with all the choices out there. This article explains the benefits of choosing an online class for your parenting education.